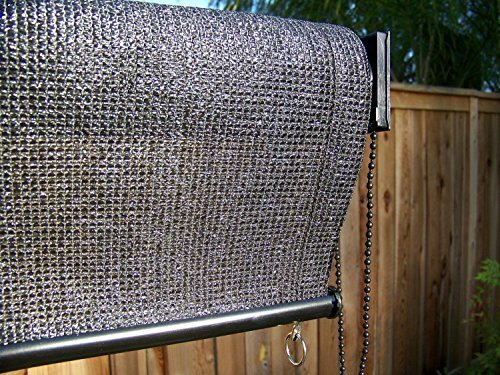 Petra's Indoor, Outdoor 4 x 6 Ft. Cabo Sand Roll Up Solar Sun Screen Blind With UV Protection. Interior-Exterior polyethylene solar Roll-up sun shade keeps area cooler by blocking the sun's rays before they heat up your window or patio. Block out the sun's harmful UV rays while maintaining visibility through our breathable, see through material. Cord safety device included, designed to prevent child or pet endangerment. Bottom rail rings give ability to attach shade to prevent moving or flapping in wind. Reduce sunlight and glare inside or outside of your home. Sleek and stylish design comes in 3 colors. Beaded adjustment cord with safety device. *Disclaimer - These are not black out shades, these are designed to reduce light not eliminate. If you have any questions about this product by Petra Outdoor, contact us by completing and submitting the form below. If you are looking for a specif part number, please include it with your message.